In a fascinating new book published this week, entrepreneur and business consultant Eric Douglas draws on his work with large and small corporations, public agencies, and nonprofit organizations to share a powerful equation: Trust + Spark = Leadership Culture. The equation boils down a simple but profound truth: highly effective leaders focus on building trust and generating innovation (spark). In The Leadership Equation, Douglas expands the equation into a Grand Theory of Organizational Excellence, consisting of five trust practices and five spark practices. As the author shares these practices, he reveals both the fundamental systems at work in high-performing companies and the specific day-to-day things that 21st-century leaders must do to sustain high levels of success. As Douglas clearly shows, when trust and spark combine in the leadership equation, leaders improve the performance of their team, their business unit, and the entire organization and, ultimately, reach their own full potential. 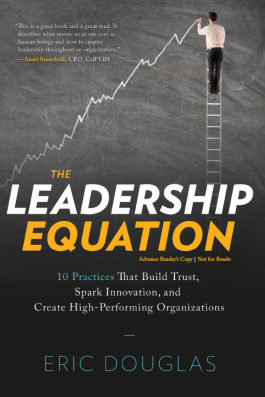 Get your own copy of The Leadership Equation: 10 Practices That Build Trust, Spark Innovation and Create High Performing Organizations. Get a Free Workshop on “The Leadership Equation”: You can schedule a free 1-hour talk with author and executive strategist Eric Douglas if you buy 15 or more copies of his new book. It’s a great idea to help develop a management team or Board of Directors.